Review – Page 25 – Rockposer Dot Com! I’m going to start by saying I am biased when it comes to this band. Absolutely love them. I must not leave out the rhythm section of the band, Dominic Hill on bass and Bob Richards on drums. To say these two run a tight ship would be an understatement. But with their combined experience one shouldn’t be surprised. I’m not going to individually ‘review’ the three tracks on this EP. Instead I’m going to simply say go buy it immediately and envelop yourself in pure class. Black Whiskey is a new band but packed full of seasoned musicians and openly admits they are not trying to do something new, which is refreshing in itself. There was in fact a black whisky called Loch Dhu from the 90s which is now very limited. Although, as a Scotsman I need to point out the word ‘whiskey’ doesn’t have an ‘e’ in it! Unless of course it is Irish! But enough of the nerdy whisky lesson! The band cites some influences in the press release and for me as soon as you cite Zeppelin and Free as influences, you seriously raise expectations. Admittedly they also cite UFO, Thin Lizzy and the Scorpions, which sounds like my thang! Opening track Idol Rich does have a Zeppelin influenced riff and is not a bad start to the album and includes a Zeppelin style breakdown in the middle pre-solo. All Seeing Eye is next up and more Scorps/UFO and chugs along on driving bass line. There is a return to a more bluesy approach for The Devil Rides which is a stomper in places and has nice harmony guitars in the middle also. Stone Cold continues in that bluesier vein and has a laid-back verse and then kicks in at the chorus with a catchy hook. There is funky wah-wah guitar opening to Hungry for Bullets which drives along but the chorus is a little disappointing and the song doesn’t appear to go anywhere for me. A more classic rock approach returns for Save My Life which gets the album back on track. Sounding a little Scorps/UFO the use of the catchy chorus returns! The Coming Storm is a slow burner of sorts and is very Free in places, especially the bridge, but is a little bit disappointing. The title track Heavy Train is a funky blues stomper and lifts the pace a little. With good variation in feel and pace, it is the best song on the album for me. Tie It Down continues the funky bluesier feel and is a little Zeppelin in places and again has good variation in pace/feel. Final track Can’t Kill the Fire is a pacey rocker to close the album but again for me disappoints. Overall the album is well played and sang and I really applaud the approach in terms of the classic rock and blues influences. There are some great moments on the album too especially the title track and the opening track. However, there is something missing for me and in places leaves me a little cold. There is also a question mark about the consistency/quality of the songs on offer. As I said at the outset, making the Zeppelin/Free reference probably raised my expectations and I am a little disappointed. Don’t get me wrong, I quite like this album but I feel like there could be a lot more from such a clearly talented bunch of guys. On that basis I look forward to the next album! One of the more enjoyable aspects of being a part-time music journalist is getting exposed to artists that would otherwise pass you by. In all honesty I had never heard of Michael Riesenbeck, but subsequently found out that he is a Dutch guitarist and has been about for quite some time. The album is a collection of songs featuring various singers most of whom I have also never heard of, except for Tony Mills of Shy, which also peaked my interest. So, down to business! First up is School Daze which kicks in with a Bad Company style opening before turning into an 80’s style AOR song a la 80s Kansas, especially the lead vocals from Rick Rici, although the chorus is more bluesy. Cold Is The Night follows and continues in the 80s AOR vein and the Kansas comparison with lead vocals provided by Danny Danzi. The song chugs along nicely but there is a rather manic breakdown with drums and keyboards in the middle. Next up is Road to Nowhere which is driven by a slightly funky bass and drum pattern and another vocalist in the shape of Bryan Woolley. The song is very reminiscent of Pat Travers 80s input circa Crash and Burn/Radioactive, especially the phased guitar sound. However, there is a ‘rap’ style breakdown, which for me just doesn’t work. Groove Machine is the first of two instrumentals which also very reminiscent of Pat Travers as above. It is a pretty decent instrumental but unlike the title, it doesn’t really groove! Rick Rici returns for Lost In You which opens with the chorus and a great hookline. The 80s guitar and keyboards sounds just reinforce the AOR feeling, although some of the breakdowns hint at more progressive leanings. Tony Mills takes over the vocal duties for the piano-driven ballad Passions, which for me is the highlight of the album. It also has a nice acoustic guitar solo. Mills also gets to show how effective he can be in the lower ranges. Selena introduces another vocalist, namely Phil Vincent. This song for me only works in parts with the chorus hook line being strong as is the middle eight, but the rest kind of lets the song down a little. Vocal duties change again as Serge Naberman takes over on another Kansas-like song in terms of the structure, keyboards and vocals called Walk Away. The song really bounces along with some jazzy progressions and a change of pace for the chorus. Rough Edges is next and is a pacey poppy rocker opening and could be from a 70s Journey album with Franky Dee sounding a little Steve Perry in places. Jostling for position as my favourite song on the album with passion, is Truly Blue. This is a slow burning melodic blues number with superb soulful vocals from Marco van der Aar and builds nicely through the song. Wandering Spirit is the other instrumental lasting over six minutes. I am not a great fan of instrumentals unless there are short and snappy or really dynamic and this is neither for me. The Show is the final song and is pacey stomper with Phil Vincent returning for vocal duties. The song fairly motors and has a catchy chorus which I don’t think is featured enough. The song also has some nice changes and accents, and although the end is a little too long, it brings the album to a suitable close. I didn’t know quite what to expect from this album as the cover art looks a little home-spun, but I was pleasantly surprised. While the sound in places is a little dry, and the songs themselves are a little bit eclectic, I really enjoyed the album. If you like 70s/80s AOR then this is well worth a spin or two! After a lengthy hiatus, since releasing Metropolis FM have been very busy indeed in terms of touring and recording, culminating in this latest release. Having been a long-time fan of the band and Steve Overland’s since seeing Wildlife support MSG too many years ago, the chance of an impartial review is slim. The opening salvo of Digging Up The Dirt leaves you in no doubt about what you are going to get from this album – and then the man sings. Sounding a little Def Leppardish, the song showcases the man’s voice in the gaps of the big staccato riff. You’re The Best Thing About Me maintains the high standard and is a mid-paced rocker with serious pop sensibilities. The intro to Life Is A Highway reminds of something else, but I can’t quite pin it down. But for me, this is prime-time classic FM and could easily sit on Indiscreet with that great chorus. Next up is Fire and Rain with a contemporary intro that sounds like it is introducing a dance/trance mix. It turns into what Bad Company could have sounded like in the 80s but only better with a great bluesy guitar lick. Incredible is the mandatory power ballad opening with the man crooning over acoustic guitar and builds nicely to a crescendo in the chorus. Call On Me lifts the pace again and is another mid-paced rocker, chugging along and with another cracking chorus and great hook-laden guitar solo. The bluesier and funkier side of the band returns with Cold Hearted. Opening with a short accapella section before the big blues riff kicks, the song drops into a funky guitar riff for the verse building to a superb guitar chop for the chorus. Another big guitar chop dominates the Shape I Am In which reminds of Huey Lewis and the News! Pacey, catchy, awesome! The next song starts with another contemporary intro before the harmony guitars kick in and another great bluesy guitar riff emerges. Entitled Big Brother, Gem’s organ provides some additional texture when it breaks through. Somedays I Only Wanna Rock and Roll as a song is as clichéd as the song title suggest and sounds like a 70s Rolling Stones rocker. However, regardless of the clichéd approach when you can sing like the man, you can carry it off! The penultimate track I Want You is another slab of melodic blues which twists and turns nicely with a great breakdown in the middle. And all too quickly we are on the last song. This is a magnificent acoustic-based ballad with lush keyboards and backing vocals called Walking With Angels. I am not a fan of albums ending with ballads, but when you can sing like the man, you can get it away with it! Moritz vocalist Peter Scallan will be joining the team here at RPR as a reviewer. We’d like to wish Peter a very warm welcome and look forward to reading his reviews. Well there is no mistaking who’s singing from the outset. Not that there was going to be any doubt on that front, with Jimmy Barnes having one of the most recognisable voices in rock. It’s staggering to think its 30 years since Jimmy left Cold Chisel. Onto the music itself. This is classic Jimmy Barnes, no doubt about that. And it’s a great twist on what is a Greatest Hits album. Rather then just release an album of the original recordings, we have them re-visited with the aforementioned help. And what a visit it is too! We kick off with ‘Lay Down Your Guns’ which of course was originally on the 1990 album ‘Two Fire’. The Living End have the honour of being the first collaboration on ‘Hindsight’ I guess there’s an amount of pressure as well as prestige for this as you’ve got to hook the listeners, who maybe are new to Jimmy as an artist. But it grabs you by the throat, full of energy, and doesn’t let go. I know it’s going to be tricky for me to pick stand out tracks as it were, but here goes…. Tina Arena’s sultry vocals and Joe Bonamassa’s exemplary playing on ‘Stone Cold’ have really added to what is one of my favourite Jimmy Barnes songs. It just works on every level and I’ve re-played it over and over again. After hearing Mahalia Barnes’ vocals on ‘Stand Up’ I must track down her other material, because wow, what an amazing voice. Without doubt the best known track is ‘Working Class Man’. Joining Jimmy is none other then Jonathan Cain (Journey) as well as Ian Moss (Cold Chisel). All the ingredients are still there from the original but somehow enhanced if that makes sense? Superb! Now let’s not let those tracks overshadow the rest of the album. Every song is a belter and it’s pleasing to see Kevin Shirley on production duties, giving us an album which has depth and clarity and not one of those over saturated releases which are coming too commonplace. As you’ve probably gathered, I’m not only a Jimmy Barnes fan, but a fan of ‘Hindsight’. You need to add this to your ‘must buy’ list immediately. It’s great to finally get to listen to not only new material from Daylight Robbery, but their second album no less. I really enjoyed the band’s first album ‘Cross Your Heart’ and their performance at the inaugural HRH AOR in Rotherham went down well with fans & critics alike. The keyboard infused intro of ‘Into the Arena’ launches you into territory which for those of you familiar with the band is instantly recognisable as Daylight Robbery. 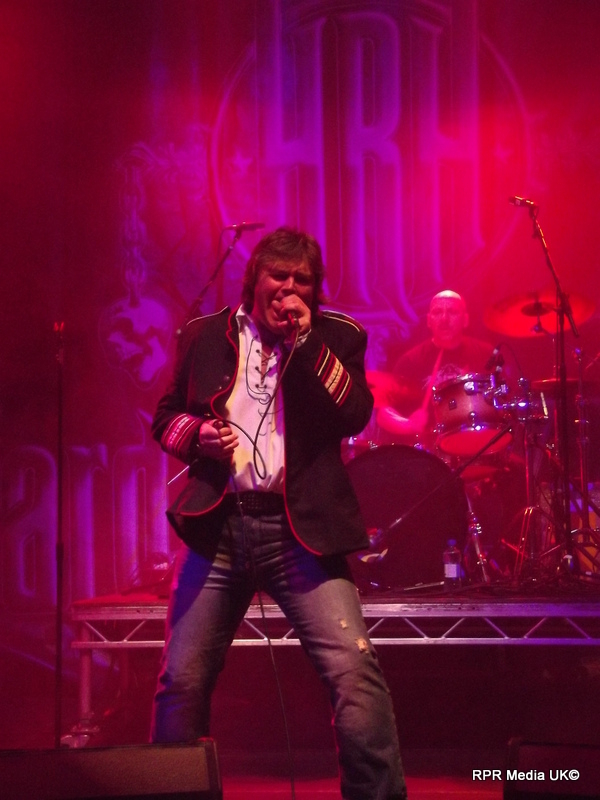 Tony Nicholls vocals, strong as always, with just the right mixture from the rest of the band. I say that because there is a tendency with some releases to overemphasise certain instruments, at the detriment of the others and the over all mix. The rest of the band being keyboardist David Billingham, who by adding piano into the mix as well as the usual keyboards enhances the feel and vibe. Guitarist Mark Carleton gives the album good solid guitar work without making the breaks overindulgent and egotistical. And then there’s the rock solid rhythm section of Colin Murdock on bass and Chris Miller on drums underpinning everything. The album was produced by the band themselves and mixed by Sheena Shea (Magnum, Robert Plant, TNT etc…) And a well produced and mixed release it is too thankfully. I would have been so disappointed if the album had been let down in these areas. ‘Samarah Never Sleeps’ is a track I’m already familiar with it having been released as a single back in the Summer. As I’ve played it quite a few times previously it’s almost like an old friend so to speak. I absolutely love the instrumental break two thirds into the track ‘Paradise Is Lost’, fabulous stuff indeed. What you get is a strong melodic hard rock album, one that can certainly stand with it’s head held high. Listening to this album I begin to wonder why the hell this band aren’t a lot bigger on the scene. This stuff ticks every box, or it does in my humble opinion. And they’re a great bunch of blokes into the bargain! Mitch Laddie & his band return with their third album, this time a ‘live’ affair. Having seen Mitch & the band in concert, it’s great to have a release that reflects not only the exemplary playing by Mitch, but the tightness of the whole band. For those of you unfamiliar with the Mitch Laddie Band, they are primarily labeled a blues act, but that doesn’t accurately reflex the varying styles you find on the albums & live. What you get is a combination of blues, rock, funk and jazz fusion which may sound a little mad, but far from it. What you get are punchy, foot tapping tunes and professionalism that doesn’t reflect how young they are. And so, to the album itself. Kicking off with ‘Awakening/Time Is Running Away’ off the 2012 ‘Burning Bridges’ release, your straight away thrust into a tight & well produced sound of the type I personally love. Too many albums these days seem to just have everything cranked up with no subtlety between instruments and acoustics. Then onto ‘So Excited’ a track I’d say is very much a traditional blues riff & format. Defiantly one for you blues purists out there. ‘Getting It Right’ is another track off the ‘Burning Bridges’ release and very reminiscent of the sort of music that fellow British blues guitarist Oli Brown is releasing. And trust me, that ain’t a bad thing! ‘Linger’ is new to me, and has a slight jazz funk vibe to it. But as I said earlier if this don’t get your foot tapping then you ain’t got soul. Next up we have a real favorite of mine, again off the ‘Burning Bridges’ album. The track in question being ‘Paper In Your Pocket’ With soaring guitar work by Mitch and a solid bass line, it’s a song to be played again & again. ‘Float on By (Butterfly)-What is Hip’ a fantastic title of a song and at 9 minutes 52 seconds long not a quick dip into the blues. A very complex song in terms of structure and one the band play without any hint of a problem live. Again I cannot emphasize how tight this band is. ‘Inner City Blues’ from ‘Burning Bridges’ is next, and presents us the listener with some wonderful soaring blues guitar, highlighting the skill and ability of Mitch Laddie. ‘What Are You Living For?’ is up next with a nice little drum intro to start us off. Leading us into a smooth, laid back kind of vibe. Well the funk style guitar is evident straight away on ‘This Time Around’ off Mitch’s first album of the same name, and the old foot starts tapping away as I listen. Just a great bass line once again, underpinning the whole song. ‘Mr Johnson (Revisited)’ is one of my favorite Mitch Laddie tracks. It is of course playing tribute to Mitch’s favorite guitarist, Eric Johnson. Just love this song, a great laid back number which fans of Eric Johnson will easily see the connection. ‘Open Your Eyes (Take it Back)’ Oh the glorious funkiness of it. Love it! And so, unfortunately, to the final track of the album. Unfortunately? Well because it’s the last track! But with ‘Them Changes’ being over 10 minutes long it helps ease the pain so to speak haha. To sum up, a fabulous live album. Well, if someone took it upon themselves to record an album that would tick the majority of boxes on my ‘like’ list then this release comes pretty close. What Lucid Dreams have delivered is a solid block of Scandinavian rock. Hailing from Norway, the band formed in around 2011 and after a period of gigging and songwriting, they have released this their first album. Produced by the band’s guitarist Rune Gutuen, the album was mixed and mastered by none other than Tommy Hanson, best known for his work with the likes of Pretty Maids, TNT, Jorn & Helloween. So there you have a strong helping hand in making this album my cup of tea. After a symphonic metal intro, the first track to hit your ears is ‘Cassies Escape’. Strong drumming combined with layers of guitars & keyboards in that European style that I like so much. A great start to what is to come. Next up ‘For Your Love’ If you like your rock to have that twin guitar attack with an infill of keyboards then you’ll certainly like this. It kind of reminds me a little of the Oliva album on the chorus. Then we have the first single ‘ Daisy Dukes’ A solid hard rock song which is definitely catchy and I can see why the band might of chosen this as their first single. Now the next track ‘Closing The Deal’ for some reason doesn’t gel the same way as the other tracks do. The style of singing on it just doesn’t really work for me. But hey most albums generally have one track you don’t like as much as the others. Things now slow down for ‘Lucid Dream’ with acoustic guitar work and long drawn out chords on the keyboards. Most enjoyable. Track 7 is ‘Stormy’ One of those tracks that builds slowly with an Eastern theme to the intro before it launches into what I’d describe as once again a real Jon Oliva style track with attacking guitar, vocals that go for the throat and an almost Jon Lord keyboard style with Thorleif Østmoe (keyboards) letting loose so to speak. Certainly some progressive influences coming through too. This is so far my favorite track on the album. ‘Take Me Away’ is again taking some progressive influences and wrapping them in a more traditional hard rock song if that kinda makes sense? ‘Paranoia’ is, apart from the ‘intro’ the shortest track on the album. And yet the band cram as much into it as they can. That’s not to say it ends up muddled by any means I hasten to add. Well ‘Wanton’ Conquest’ is what I would call a fun track. The band letting things stray away from the more serious tracks on the album. ‘Light In The Sky’ is a straight forward hard rock song with keyboards taking the lead and a song chorus that immediately sticks in your head. And last but certainly not least we arrive at the twelfth and final song on the album ‘When I Die’ The backing vocals remind me of Uriah Heep in some ways and Fredrik Sindsen’s vocal style continues to remind me of Jon Oliva. I’ve already mentioned what to me are Oliva style sounds to the album and this is in no way a bad thing. As far as I’m concerned, quite the contrary. In conclusion, ‘Lucid Dreams’ is an album I’m really enjoying and I can whole heartily recommend you check out the band & album. I was waiting for this album with much anticipation so it had a lot to live up too. With Paul Sabu on production and also bass duties for that matter, it had all the boxes ticked theoretically. Well after having spent time listening to this release I can honestly say I’m not disappointed. Out of the four Jesse Damon solo albums, this is by far the best. Okay I’m a big fan of Jesse’s work both solo and of course with Silent Rage, but the production on the earlier releases is by no means on par with this release. It’s an album of two sides, by which I mean there are tracks that are most certainly Jesse solo material, and tracks that would easily slot straight into a Silent Rage album. The production is big, full of punch and space. All too many albums these days sound either compressed or overblown. Not so with this. Having Pete Newdeck (Eden’s Curse/Tainted Nation) on drum duties and backing vocals helps fill the tracks with a real element of depth. I absolutely love the late 80’s style keyboards courtesy of Eric Ragno, who lets face it can be found on so many great albums. A prime example would be the second track on the album, “Black Widow”. To sum up, if you love that late 80’s style but with a modern twist then I can wholeheartedly recommend this.